As someone who has over 20+ years of working with racehorses as a groom, hot walker, breaking 2-year-olds, galloping as an exercise rider, riding races as a professional jockey, and reschooling them after retirement–I call bunk on this misinformation. Here Is My List of the Top 5 Most Ridiculous OTTB Myths. Yes, they do. There are considerations about the preferred or dominant direction. One is the country of origin where the horse raced. In the US we trek left, in many other countries, they trek right. Another consideration is the individual horse's laterality. Horses, like people, are either right or left side dominant. So, even if they train consistently in one direction it may still be their hollow or weaker side. It’s also important to note that horses frequently “jog” or trot in the opposite direction of galloping or racing. Good trainers will often train in the opposite direction (usually on the farm or where they aren’t restricted to track rules) to strengthen both sides and balance the musculature symmetry of the horse. Wait, what? When Thoroughbreds go through the breaking process as 2-year-olds on the farm, riders use their legs (with pressure) as aids. Thoroughbreds aren’t broke by riders riding “short”. It’s not practical or safe to gallop a super green 2-year-old with ultrashort stirrups and no leg pressure to guide them. You cannot ride a green horse off-the-bit, alone. Riders start a green horse under saddle with long stirrups using leg pressure as an aid to guide the horse and longer stirrups give you support to stay on if they are unruly. The gradual reduction of leg pressure comes as the horse advances in their training and understanding of their job. It does happen quickly, but only when they've shown a certain level of maturity in training, do they come off the farm and go to the track. Once at the track, that’s when you’ll see riders “jack up” their irons, usually in preparation for an open gallop or breezing. There is a saying on the track, especially amongst those of us who are veterans and have galloped for several years, “The longer you rider, the looooonger you ride.” So, in short, YES you can use leg pressure on your ex-racehorse. Another vast generalization. Some horses can benefit from downtime before retraining, especially horses that have become sour under saddle or are rank in their disposition toward work in general. Or, the obvious issue, they have an injury that requires layup time or some form of rehabilitation. Other horses that have retired sound or maybe they are "non-starters", could benefit from transitioning directly into reschooling. It’s best to determine the individual horse’s history and observe their behavior, then make a decision based on an educated assessment, whether they would benefit from time off before reschooling. It depends on the horse. Since horses, like every other creature, are individuals, it’s wise to consider your approach and methods of training in a unique manner for every ex-racehorse. A trainer would also have to take into consideration past or current injuries, behaviors or vices on the track or under saddle and other factors to determine the proper type of reschooling. My personal preference is establishing a solid foundation with groundwork, first. YES, they do. Did you know during an average 1 mile gallop, a sound thoroughbred will change their lead at least 4 times? When they are on the backside and the stretch—they are on the outside or right lead. When they go through the turns they switch to the left or inside lead. Many horses will change leads when you ask them to and if you know how to ask. When working with 2-year olds, a good rider will teach them and ask them to change on the turns. An exception to the refusal of lead changes is when a horse's range of motion is compromised due to an underlying physical issue. Many times unaddressed physical issues can cause a horse to compensate and remain in the more comfortable lead to avoid physical discomfort. 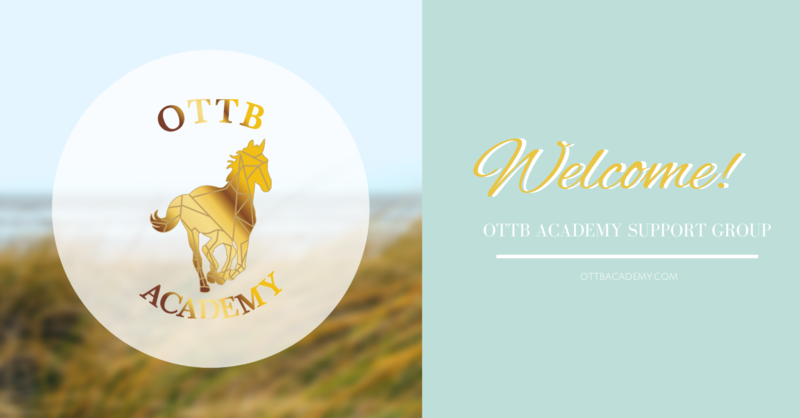 Of course, there are many more myths about ex-racehorses floating about the Interwebz on various horse publication sites and social media, but I found these to be some of the most ridiculous and ignorant myths about our beloved OTTBs. Sign up for the Improve Range of Motion webinar, to see if your horse is a good candidate for the "Get Strong and Stretchy" Course. Take the quiz and get FREE access to the "Get Strong and Stretchy" beginner's guide so you can start simple exercises to improve your horse's strength and mobility TODAY. I’m Raina Marie Paucar and probably just as horse crazy as you are, consumed with learning more about them, spending all my MONEY on them, doing everything I can to HELP them and basically being their human slave to provide EVERYTHING for them. I’m a mother to human, furry and scaly creatures. I’m an innovator, in that I constantly find ways to improve things. I’m an educator, I love teaching the things I know to other equestrians who are interested in the betterment of their horse’s quality of life and well-being. I’m a professional in the industry with multiple certifications who knows how to get real results for horses utilizing holistic methods to improve equine flexibility, strength, mobility and increase range of motion. I'm a former female jockey, a certified equine massage therapist, certified equi-tape® practitioner, pursuing my vet tech degree and equine rehabilitation practitioner certification. I've been featured on equestrian blogs and podcasts in addition to writing my own. Mostly, I enjoy reading the teachings from classical masters such as Antoine de Pluvinel, Nuno Oliveira, Jean-Claude Racinet.